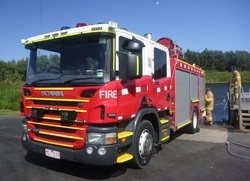 The main vehicle in Warrnambool fire brigade’s fleet is the Scania P320 Heavy Pumper. This is Warrnambool’s primary vehicle for urban incidents including structure fires, motor vehicle accidents and fire alarm response. The heavy pumper carries a crew of five firefighters, of which two can don breathing apparatus in the rear seats while travelling to the call. This ensures that once on scene they are ready to carry out their tasks. The heavy pumper also incorporates other specialty equipment such as forcible entry gear, a roof mounted water monitor and equipment for atmospheric monitoring and ventilation. The heavy pumper has a water capacity of 2000 litres which is pumped by a 4000 litre per minute Godiva pump. The pump has both high pressure and low pressure stages; the high pressure is delivered through twin side-mounted 60 metre hose reels. Propelling the Scania’s 13.2 tonne of weight is a 320 horsepower inline 5 cylinder turbocharged diesel engine through a 6 speed automatic transmission. 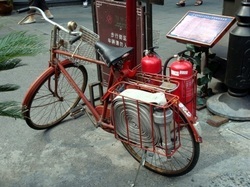 The heavy pumper also incorporates safety features such as a reversing camera, EBS, ABS, ESC and traction control. 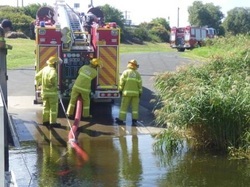 The Scania was added to the Warrnambool fleet to replace the Isuzu Type 3 Heavy Pumper in early 2011. After a training program to bring people up to skill with the new truck it was placed 'on line'; and it wnet straight into action. On the first night that the truck was 'on the run', it was dispatched to a factory fire at Camperdown, some 70 kilometres from Warrnambool. At the scene it was deployed to supply water to Geelong City's Ladder Platform. After severl hours pumping into the platform it was released and sent back to warrnambool, well and truely 'commissioned'. It has been the first truck in to several major fires now, including the fie at Flagstaff Hill detailed elsewhere on this website and the Telstra Exchange fire.